Barack Obama has made a speech, saying that this Memorial Day is the first in 14 years without major US war. Critics and social media users slammed him as hypocritical, saying the US remains involved in military conflicts and proxy wars. “Today is the first Memorial Day in 14 years that the United States is not engaged in a major ground war,” Obamasaidon Memorial Day, a US holiday for remembering those who died while serving in the country's armed forces. 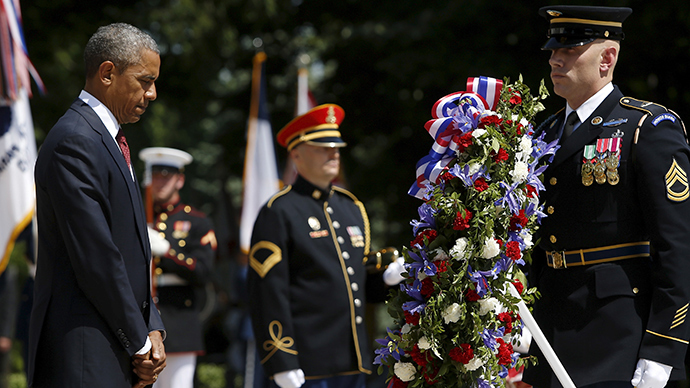 “And as so many families know, our troops continue to risk their lives for us,” Obama said. The statement by US president was met with strong criticism both from experts and social media users. “What a joke. Of course the US is still at war,”wrote Brian Fernandes, a user on Facebook. “The US still has troops in Afghanistan and plans to keep them there for years. And they have fomented wars in Ukraine, Africa, Syria, and now Yemen. The US is the most barbaric war-mongering nation on Earth,” added another, Richard Tina. The 13-year war US war in Afghanistan ended in December 2014, concluding in a cost of nearly $1 trillion and the lives of over 2,200 Americans, according to the New York Times. Despite America’s combat operations being rolled back, troops remained as part of an agreement reached between Washington and Kabul. Afghanistan still sees explosions and shootings. In January three US military contractors were killed in Afghanistan, after gunfire erupted at Kabul International Airport’s military facility. The Taliban’s leadership declared that the Obama administration’s decision to slow US troop withdrawal from Afghanistan would hamper peace efforts in the country. Washington is “participating pretty directly in an ongoing conflict in Iraq” in addition to a number of proxy wars that they are supporting," former US marine Ross Caputi told RT. Caputi believes that the US government is attempting to present a certain picture of US foreign policy and US military engagements around the world. Washington uses “misinformation” which is a part of “perception management,” he says. Countries once invaded or interfered with by the US and its allies - Afghanistan, Iraq, Libya, Yemen, Pakistan, Somalia or Syria - have become hotbeds for militants from Al-Qaeda, the Islamic State (IS, formerly ISIS/ISIL) and similar terrorist groups. Though Washington has not officially declared war since 1941 (in WWII), Syria became the seventh country that Barack Obama - recipient of the Nobel Peace Prize - has bombed in his presidency. Washington is also involved in on-ground training of the military in the countries, engaged in internal wars, including the one in Ukraine. In April, paratroopers of the US 173rd Airborne Brigade arrived in western Ukraine to provide training for Ukrainian government troops who fight against rebels in eastern Ukraine.